Welcome to today's Commemoration at the Chinese Embassy. Before I begin, allow me to say a few words about the explosion in Tianjin. At this moment, our hearts are with all those coping with the aftermath of the deadly disaster. Please allow me express the most sincere condolences on behalf of all of us to the victims and their family members. Since it happened, there has been an outpouring of sympathy from the British public, not least from the Foreign Secretary Philip Hammond, who expressed his deep condolences to State Councillor Yang Jiechi during the China-UK Strategic Dialogue in Beijing. Let me take this opportunity to express our deep gratitude to our British colleagues and the people of the UK. · The 70th anniversary of the Victory of the Chinese People's War against Japanese Aggression. · The 70th anniversary of the World Anti-Fascist War. So, 2015 is a year of special significance. Since the beginning of this year, countries around the world have held various forms of commemorations. · In early May, there were a series of VE Day events at multiple locations. · Tomorrow, the 15th of August, a special commemoration of the VJ Day will be held here in London. China will also join the people of the world to remember that part of the history. China will hold a series of solemn commemorations in Beijing on 3rd September, including a military parade. This will be a time to honour the dead, to cherish peace and to aspire to build a better future. The Chinese People's Resistance against Japanese Aggression was an important part of the World Anti-Fascist War. This reflects how China was the key Far-Eastern theatre during World War II. On 18th September 1931, the Japanese aggressors invaded northeast China on a pretext of their invention. The Chinese people rose up in resistance. That was the prologue to the World Anti-Fascist War. These actions by Chinese people led to China pinning down and fighting against the main force of the Japanese militarists. This resulted in weakening their war capacity by over one and half million troops. There is no doubt China played a decisive role in the final defeat of the Japanese militarist forces. To achieve that, the Chinese military and civilians made enormous sacrifice – 35 million casualties. That's about 70% of the total population of the UK at the end of World War II. Strategically, the war in China was a support to allied operations in Europe and strategic moves in the Pacific theatre. It also prevented and upset the strategic coordination between the Japanese Fascists and the Fascists in Germany and Italy. China's contribution to the victory over the Fascists forces has indelible historic significance. However, for many years, very little has been said in Western history and school textbooks about the Chinese people's war of resistance. The enormous sacrifice and important contribution of the Chinese people seem to have been overlooked or forgotten by the West. In recent years, in British academic and history studies, many people have begun to revisit and look deeper into that part of the history. That is a gratifying development. And I believe such studies demonstrate an objective and just attitude as well as due respect for the history. Chinese and British historians could strengthen cooperation in the studies of the resistance war in China. A lot can be done in this area. As President Xi Jinping said recently, the studies into the resistance war are falling far short of its place and significance in history and its impact on the Chinese nation and the wider world. Studies into that war must continue, go deeper and be systematic. They should focus on and seek to provide an in-depth interpretation of the significance of the resistance war. They should aim at shedding light on the Chinese people's resistance against Japanese aggression and its rightful place in the World Anti-Fascist War. We must allow history to speak for itself. We must raise the voice of historical facts. Historical facts reveal enormous sympathy and support for China's resistance war from many governments and people, including those of the UK, the USSR and the US. The UK came to China's help with economic aid and military cooperation. British soldiers fought side by side with their Chinese comrade-in-arms. · Heavy casualties of 90,000 on the battlefield, of whom 36,000 died. · There were 12,000 British deaths in Japanese POW camps. 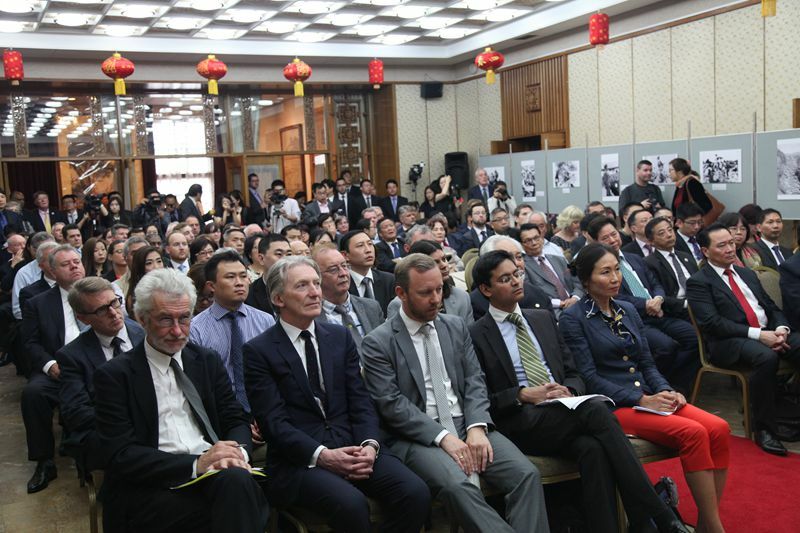 · In the UK people set up various organisations in support of China's resistance war. 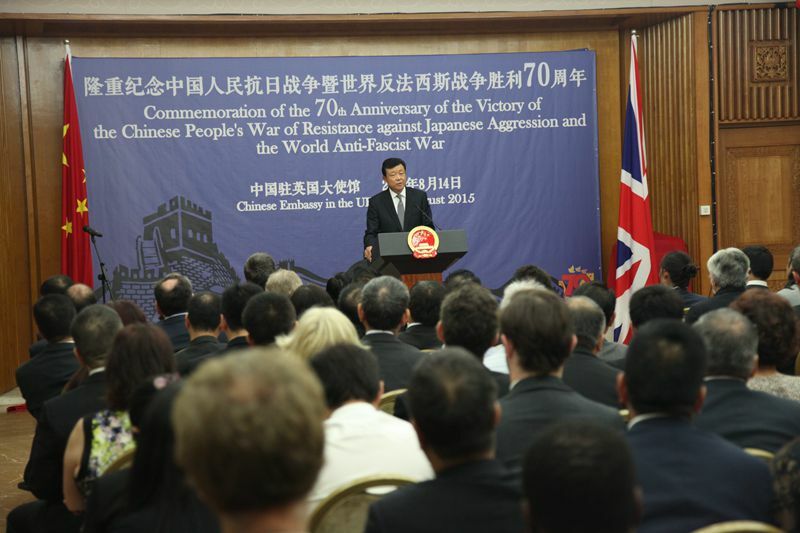 · They told the British public about China's resistance efforts. · They raised funds and collected aid materials for China through donations and charity sales and performances. · They held a number of large-scale boycotts of Japanese goods. 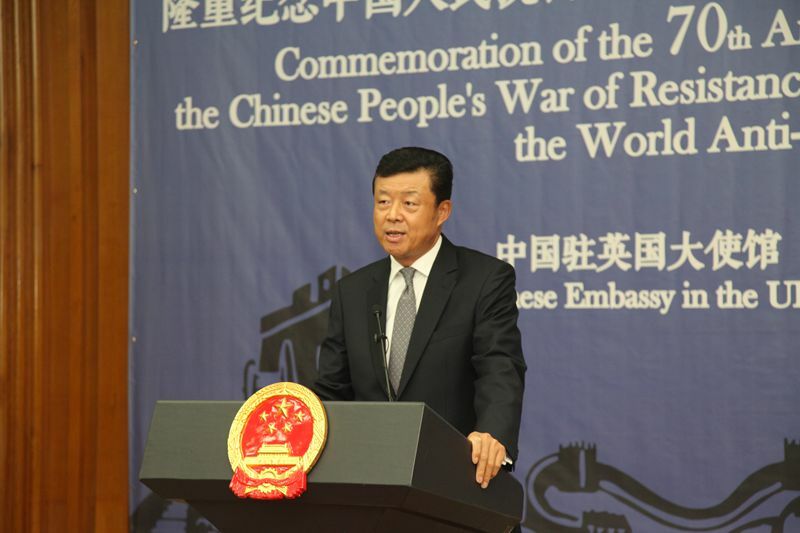 · Their efforts were a strong support to China's resistance war. The Chinese people will never forget this friendship from Britain when the need in China was so great. Historical facts also tell stories of great courage and valuable partnership. In early 1942, the Chinese expeditionary army fought and defeated the Japanese troops in a series of deadly battles spanning over 1,500 kilometers in Myanmar. This operation, while incurring painfully heavy casualties on the Chinese army, successfully lifted the Japanese siege on the British troops. Also in 1942, fishermen from Dongji Island of Zhoushan in China risked their lives, trying to rescue hundreds of British POWs who were prinsoners on the sinking Japanese vessel Lisbon Maru. The fishermen then brought what were their only clothes and food to the saved British soldiers. The British government later awarded the General of the Chinese expeditionary army with a medal of honour. A grand event was held after the war in memory of the Sinking of the Lisbon Maru, in which the Chinese fishermen were praised for their courage and humaneness. In the European theatre, 24 Chinese naval cadets took part in the Battle of Normandy. Their courage and bravery were praised by Prime Minister Winston Churchill. The victory of the War in China and the World Anti-Fascist War as a whole is a major turning point in human history. The victory has had a profound impact on the post-war international landscape and world order as well as the development of international relations. · The United Nations was founded. · The UN Charter was established. · A new mechanism for safeguarding world peace and security was formed. · The world bid farewell to the frequent wars between major powers or power groups and embraced an era of relative stability, peace and development. Today, in the age of globalisation and information technology, the world we live in is becoming a community of common destiny. This community embraces every country and everyone is in it. Everyone owns it and is responsible for it and for each other. · The victory marked a historical turning point. China has since embarked on a road to national renewal. · The Chinese Communist Party led the Chinese people in founding the People's Republic of China and realising the greatest and most profound social evolution. · China has emerged from poverty and weakness as the second biggest economy in the world. · Today, the people of China are striving to realise the 'Chinese Dream of great national renewal'. · China was the first to sign the United Nations Charter. · China is a co-initiator of the Five Principles of Peaceful Co-existence that embody the spirit of the UN Charter. · China is instrumental in making these principles a widely recognised norm governing international relations. In international relations, China always advocates peace, development and win-win cooperation. What China calls for is a state-to-state relationship centered round win-win-cooperation. In multilateral cooperation, China is always an active participant in the settlement of hot-spot issues and in global assistance efforts in developing countries. With regard to UN peacekeeping, China has so far participated in 29 operations, contributing more troops than any other permanent members of the Security Council. As we speak, there are 3,000 Chinese military personnel in UN peacekeeping missions all over the world. In the 70 years following that great victory, China-UK relations experienced eventful progress. Overall, the bilateral relations have grown from strength to strength. · The charge d'affaires level relationship was upgraded to a full ambassadorial diplomatic relationship. · The comprehensive strategic partnership was established. · The relationship is reinforced by the Annual Prime Ministers' Meeting and three major pillars – the Economic and Financial Dialogue, the Strategic Dialogue and the High-Level People-to-People Dialogue. · There are also scores of bilateral dialogue and consultation mechanism on specific issues. · There are 51 pairs of sister cities and provinces or counties. · Bilateral trade and investment cooperation has expanded at an exponential rate. · And cultural and people-to-people exchanges have reached an unprecedented level. 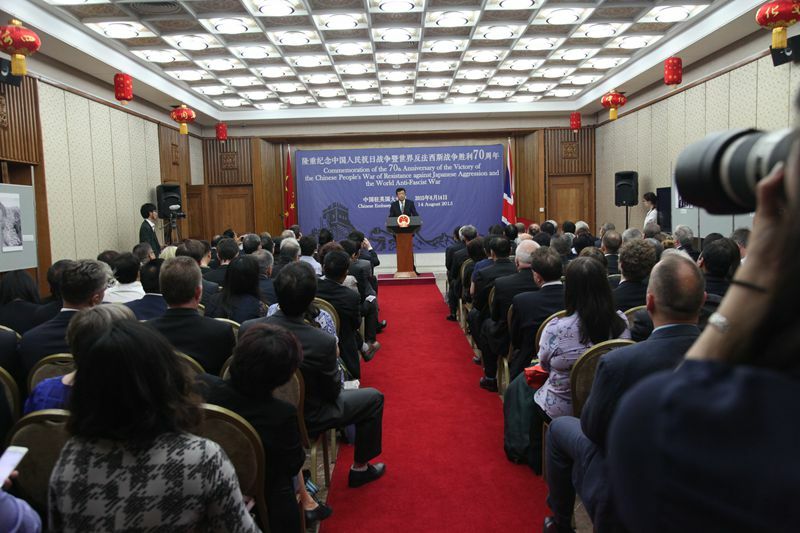 In summary, China-UK relations have embarked on a fast track of advancement. In this coming October, at the invitation of Her Majesty The Queen, President Xi Jinping will come to the UK for a State Visit. This visit will become a new milestone and start a 'Golden Time' in China-UK relationship. Looking ahead, we have reason to feel confident and hopeful of the prospects of China-UK relationship. The past, if not forgotten, serves as a guide for the future. Today, this Chinese maxim remains so very relevant. "That men do not learn very much from the lessons of history is the most important of all the lessons that history has to teach". · We must never let some forces attempt to deny the atrocities and crimes of the Japanese aggressors. · We must never let them distort the history of the Second World War. · And we must never let them whitewash militarism. History must be remembered in order to urge Japan to learn from the lesson and adhere to the road of peaceful development. · Japan must face squarely its history of aggression. · This is the only way for Japan to avoid taking the same disastrous road of 70 years ago. · That is the only way for Japan to win back the trust of its Asian neighbours and of the international community. · We remember history in order to take its guidance as we embrace the future. · We remember history to avoid a repetition of the tragedy of war. · And we remember history so that the world will enjoy lasting peace. 70 years ago, China and the UK were allies against the common enemy. We were both victors of World War II and founding members of the United Nations. 70 years on, China and the UK are comprehensive and strategic partners. This means that China and UK both have the responsibility to uphold the outcome of that victory. It means China and UK working together to safeguard the post-war international order. It means China and UK collaborating and joining hands in writing a new chapter of peace for all mankind.